Many of us spend the majority of our working day at our desk, whether in an office or at home. It can be easy to feel frustrated and a little trapped in the same environment day after day but it is possible to make your desk feel more welcoming. I recently got a new desk and it’s been lovely setting it up and adding personal touches. Here are 3 items to add to your desk to make it more personal, as inspired by Furniture At Work and their recent My Desk Story campaign. Fresh flowers can totally transform a desk. You don’t need to spend a huge amount on flowers, go for a small bunch or even a single stem in a dainty vase. They needn’t overwhelm your workspace, but choose a flower you love the look and/or scent of to make your desk feel more of a haven than a cell. If you really can’t afford to replenish flowers regularly, pick up an artificial alternative to add a bit of colour or a succulent, which doesn’t need much to survive and lasts longer than flowers! Consider adding some prints to bring a little personality to your desk. I love both Desenio and Poster Lounge for inexpensive prints in a huge range of designs. Slogan prints can really help motivate when things get tough. Hang prints on your wall or on your desk itself to add identity and charisma to your workspace. 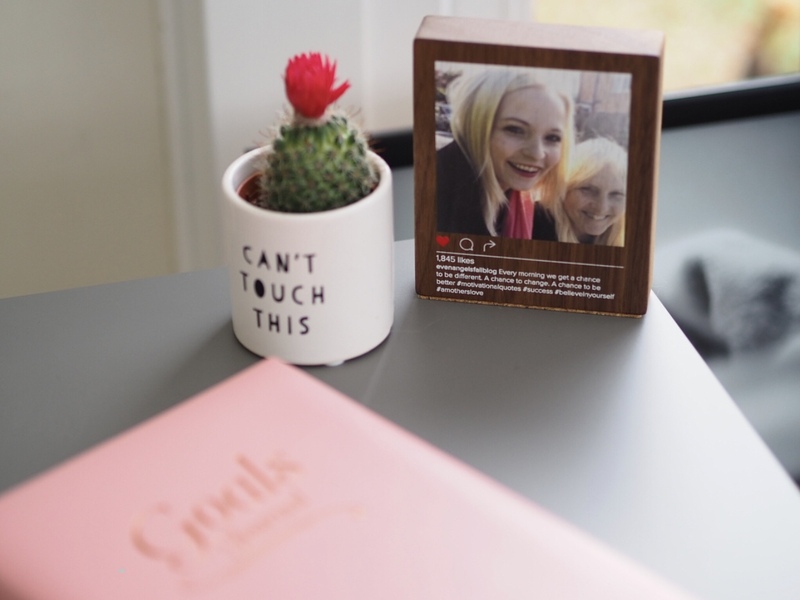 One of my favourite items on my desk is a personalised wooden social media block from Create Gift Love. It is made up to look like an Instagram image, complete with caption and hashtags and I had it made when my mum was awaiting results for tests for a serious health issue. The photo was taken on a school run, where we were both laughing at something and look so naturally happy. I really love it and, even though fortunately my mum’s tests came back fine and she is ok, it will always have pride of place to remind me of what is most important in life. This is a collaborative post, however all words and images are my own.